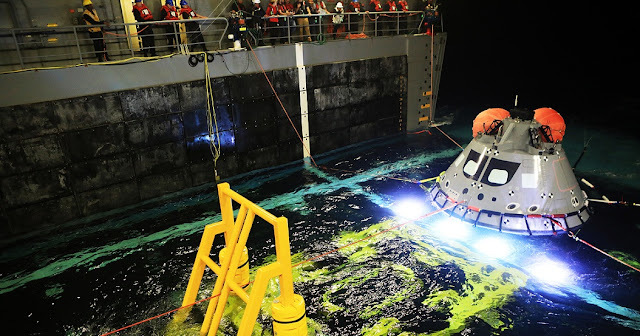 Departing from NASA’s Kennedy Space Center in Florida, the Exploration Ground Systems’ team embarked on the USS John P. Murtha, an amphibious U.S. Navy ship, in the Pacific Ocean with the main goal of ensuring all of their recovery equipment was up to the task. This round of testing was known as Underway Recovery Test-7, or URT-7. Recovery ground support equipment includes the Orion Recovery Cradle Assembly, or ORCA, the cradle in which the spacecraft will ultimately set down; winch and rigging lines lovingly referred to as LLAMAs, short for Line Load Attenuating Mechanism Assembly; and even seemingly small items, such as tow pins. But ensuring all of the equipment works as planned and without damage to the spacecraft is no small task. The integrated recovery team worked in tandem to put the equipment through its paces this past week — and NASA’s Jeremy Parr, lead design engineer, was on hand to evaluate testing. For the past five years, Parr and others have been working on the recovery concept. With the exception of the winch’s control system, everything has been designed and built in-house at Kennedy under Parr’s leadership — and it all passed muster. The entire Landing and Recovery Team is led by NASA’s Melissa Jones. During URT-7, she was pleased to see all of the team’s hard work pay off. “Testing this week has gone extremely well,” she said. The team performed the first complete recovery at night, which lasted until the wee hours of the morning. Jones chocked that up to lessons learned on possible complications of night operations and working with the ship and divers out in the open water in less-than-optimal conditions. The crew aren’t the only ones with a positive attitude. Parr and the rest of the team are heading back to Kennedy with a renewed sense of accomplishment.